Once again there are several factors to consider when choosing the starting point and the route to Santiago de Compostela. Among many others, it depends on the number of days available to the pilgrim, the time of year, and, the preferences of each individual … Below this is a Camino de Santiago guide with a summary of each route so future pilgrims have an idea of ​​what awaits them. This is by far the most famous route, the busiest and the most typical. The French Way has several advantages to it beyond that of its scenic splendour, artistic quality and historical merit. It is one of the best signposted (although, sometimes a rogue landlord may play a trick to confuse walkers) and, it has the highest number of Hostels. As it is the busiest, there is usually no problem in finding supplies. During summer months, the large number of pilgrims huddled in the doors of the hostels seeking accommodation highlights possible problems pilgrims may encounter in finding a bed. In turn, this causes hikers to begin each stage as though it were a race, departing early in the day to reach the finish line first and avoid missing out on a bed in a hostel. The second most popular route. It enters in Galicia via Tui. Until its arrival to Santiago it passes through the most populated locations of Galicia, through cities like Pontevedra, historic villages like Padron and Caldas and, small hamlets. Pilgrims often complain that there is much asphalt, although there is normally not much traffic on these roads. Well signposted and with more than enough hostels to meet demand. This is the only route that does not end in the Galician capital. The vast majority of the pilgrims use it as an extension to their adventure to Santiago. It has a great tradition, given that from the XII century the Codice Calixtino linked these territories to the worship of the Apostle’s tomb. Burn your clothes and get rid of your old boots in the ” end of the world ” watching the sun sink into the Atlantic is one of the moments that pilgrims take home for the rest of their lives. In the summer months it can become crowded. This route is becoming increasingly popular. The origins of this Camino can be traced back to the ancient Roman route that links Astorga to Mérida. Years later and, following various expansions, this path was used by the Arab people in their conquest of the Peninsula. It penetrates Galicia through Portelas do Padornelo and A Canda. It is one of the easiest routes, although the first stages in Galicia are quite demanding. Some areas may cause problems due to a shortage of places to purchase supplies. Beware of extremely high temperatures reached in the summer. For cyclists this is the only route in Galicia that allows them to obtain the Compostela. Those departing from Gudiña will cover 200 kilometres and are therefore, entitled to the Jacobean certificate on reaching Santiago. Ferrol and A Coruña are the two starting points for the same Camino. These two cities were the main entrance doors to Galicia for pilgrims from Britain and from northern Europe when travelling to Santiago to embrace the Apostle. Temperatures, even in summer, are usually respectable for walking. It is not one of the busiest routes and, consequently does not have a high number of hostels for pilgrims. In some locations even the inhabitants have little knowledge about the passing the pilgrimage route. 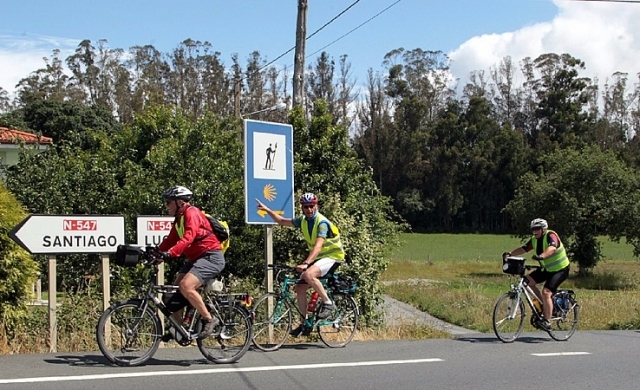 Cyclists will forfeit the Compostela as there are not enough kilometres covered. As strengths, this route offers stunning, shaded landscapes and, despite not being one of the busiest Caminos it has an ample network of accommodation. On the other hand there is a lack of cultural heritage in comparison to other routes and the majority of sights are highly concentrated to certain locations such as, Mondoñedo. The Primitive way is the oldest of the Caminos to Santiago. And, one of the most demanding for pilgrims, passing through very sparsely populated mountain areas with hardly services in the less known parts of Galicia and Asturias. On the positive side, walkers can enjoy beautiful places, without crowds or the need to race; visits include the two historic cities of Oviedo and Lugo, and the hike involves little time on asphalt, this route is recommended for walkers only, probably one of the most attractive of all the Jacobean ways.